It took us 7 hours and 5 trains and a coach to get to Waddow Hall for Wellies and Wristbands 2013, but it was thoroughly worth the effort. This was a new 'initiative' this year run centrally by GuidingUK with events happening simultaneously at Waddow and Foxlease training centres. Apart from the 'festival style' tent pitching instead of horse shoes initially it felt very much like a large scale camp. It was well organised (if a little lacking in information giving initially). There were volunteers from the camp on the station platform to meet and greet, the coaches from the station to Waddow were spot on, there was a well organised check-in, well marked pitches (even the randomness of festival style was controlled to give it the perfect feel without any down sides). I just can't fault the Guiding led arrangements. Our Rangers would have liked a Senior Section camp area, they always prefer this at large scale events. It helps them to mix better with other units. Some events do it, some don't. There was a wealth of activities available: crate stacking, tree climbing a very very tall tree!, Jacob's ladder, low ropes, abseiling, zip wire, canoeing, kyacking, rafting, warrens, archery, pioneering, wood craft, marshmallow toasting obviously!, craft tents. But this wasn't just a Guide camp, this was a festival so there were also indulgence tents, art tents, african drumming, street dance, cheer leaders, tattoos, hair braiding, belly dancing, inflatables, bungee racing, bucking bronco, surf boarding. Honestly the list of things to do seemed endless. 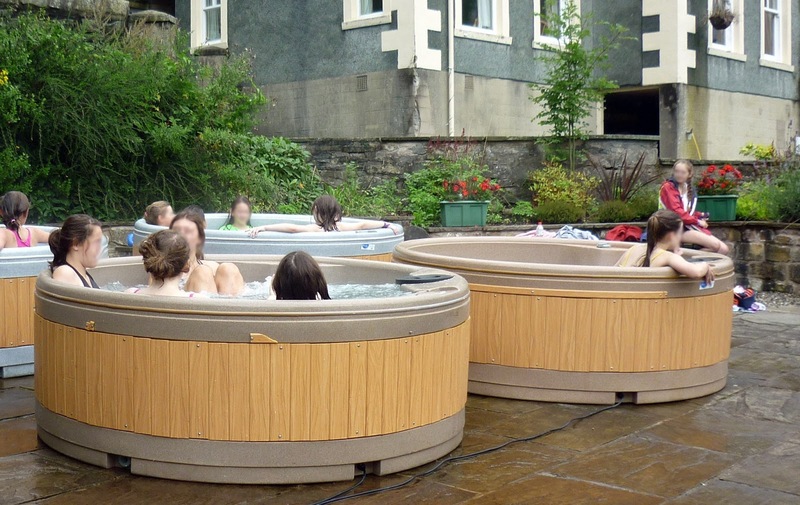 The hot tubs went down a treat! I love the way the girls are given opportunities to develop their confidence and self without even realising they are learning - they think they are just having fun - bless them! I sat in the sun watching some girls get a briefing for canoeing. They then had to pull the boats down to the water get in them and off they went. Health and safety was very tight, I was watching the instructors but the girls will have felt like they were off on their own. You should have seen their proud smiles as they came back to shore after shaky starts. I couldn't see the smiles on the girls doing night line but I could hear them shrieking with laughter especially after they were hosed down at one point. The catering was also festival style and I think the organisers learnt a lot from this first W&W event and changes will be made for future ones. We all truly wished we were living off eggy bread. The Chief Guide, Gill Slocombe, went to both sites. It was wonderful to see her just being a Guider about site, relating to and interacting with the girls and Guiders. She must have been tired already having 'done' Foxlease before travelling up to Waddow. The Chief Executive, Julie Bentley was also there, having come up from Foxlease too. I realised when I found myself stood right behind her watching the Chief Guide. How fantastic that she too was stood in a field in blues and just being part of the camp. 'Back to the floor' is something I always advocate and there she was, doing just that. And what's more, when I asked her if I could take a photo for my website - she knew who I was, I'm taking this to be a good thing! The lady in pink with Julie Bentley (in green) is quite incredible. A Guider extraordinaire and wow, she can dance. Back to the festival, there were 3 nights of bands with a fantastic atmosphere. The highlight for me was Saturday night which had an amazing band and an incredible atmosphere. But on Sunday night with a warm breeze and the sun just starting to go down, the band on stage started to jam Sweet Home Alabama. That was pretty cool. It was a great way for the girls to have a taste of a festival in a totally safe environment. Free to be themselves but within the well-honed Guiding large scale camp environment. The balance worked perfectly for me. It was also an opportunity for us to say the current promise, that is to change very soon, on mass one last time. I always love it when we do that as a group, it's a reminder of our bond. If you were hesitant about taking your girls to a Wellies and Wristbands in 2013 I thoroughly recommend it for 2014. It was a fantastic balance of festival meets Guide camp. The organisers must have worked very hard and it paid off. There were some lessons to be learnt but one of the things Guiding is good at is change for the good and I think Wellies and Wristbands 2014 will be bigger and better - go for it. For those of you reading this not in the know, I'll add that these events are organised and run totally by volunteers. No one gets paid a bean to be run ragged for a week and have months of work leading up to it. GuidingUK is full of the most incredible people. It always amazes me that they will work so hard to give the girls (and me) these incredible opportunities - thank you W&W team.